Founded in 1936 in Milwaukee, Wisconsin, Charter Wire has grown from an early pioneer in cold rolled steel manufacturing technology into a global leader. Today, Charter Wire is a major supplier of precision wire products to manufacturers around the world. Our standard cold finished steel bars and custom cold rolled steel shapes and wire profiles are integral components in thousands of manufactured products. 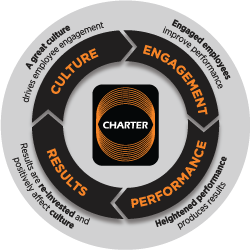 Charter Wire LLC is a member of the privately held Charter Manufacturing family of companies, with whom we are vertically integrated to provide best-in-class support, service and turn-around times for our customers.